Really. Discerning dog owners know that some plants can be toxic to dogs. Lavender is not poisonous to dogs. In fact, the highly effective insect-repelling, soothing, antiseptic and anesthetic properties of lavender lend themselves quite naturally to a variety of dog needs and dog owner needs. - Rub a few drops of Organic Lavender Essential Oil into your dog's collar to calm nervous and anxious dogs on car trips or airplane flights and during thunder storms or firework shows. For extended trips in kennels give your dog a Lavender Pet Pillow to keep him or her company and soothe any anxiety. - Bathe your dog regularly in Lavender Pet Shampoo to discourage fleas while at the same time enhancing the shine and smoothness of you dog's coat. - With spring comes warmer weather, fresh blooms and spring showers. Unfortunately for dogs and their owners, spring also brings flea season. Instead of resorting to chemical treatments, regularly apply Organic Lavender Essential Oil between your dog's shoulder blades to keep fleas and tics at bay. - After a romp at the beach or park Lavender Room Mist keeps the car smelling nice and fresh on the way home. - To soothe hot spots and dry or cracking dog paws apply Lavender Therapeutic Salve for effective relief. - Protect your dog's health by using Organic Lavender Hydrosol to clean floors, dog bowl, kennel - anything your dog comes into contact with. Georgia & Michael's rescued schnauzers. Here's what a couple of dog owners had to say... "We want to let you know how happy we are with the Lavender Pet Shampoo. Prior to using this shampoo on our dogs we had a problem with ticks. 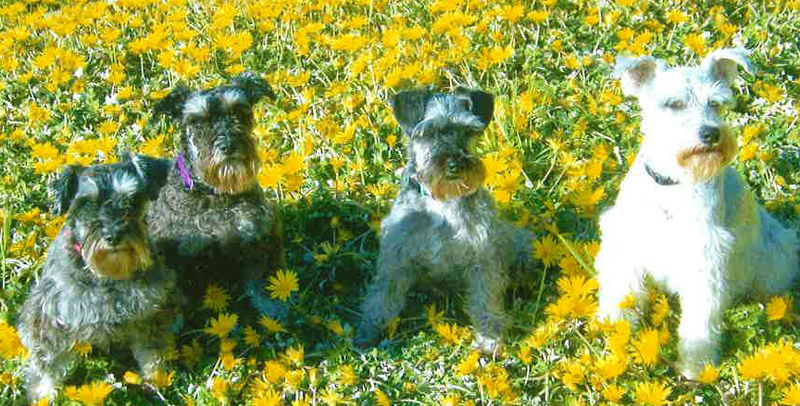 We have 4 miniature schnauzers, for just over 4 years now we bathe them once a week with the Lavender Pet Shampoo. Besides the obvious nice relaxing aroma of the shampoo, there have been no ticks on the dogs. It is a natural repellant. I just love it. Its easy to place an order and it always arrives prompt. Thank you so much." - Georgia & Michael S.